I have not given up on trying to catalog the various sites we visited last year in France on my research trip for my novel. It is simply finding time to blog amongst all the other things that vie for my attention. As I left off, my husband and I had spent a busy week in Paris visiting what seems like endless churches, museums and historical sites. Then we picked up our lease vehicle and drove south to the Midi-Pyrenees region after first stopping off to visit Guédelon. So we were in need of a rest and I had promised my husband that we would have a "down day" and not have to go fact finding. That was my intention. Then we started chatting with our hosts Michael and Sarah about when farmers markets were held in the different towns and villages nearby. So we set off to see Saint-Antonin on Sunday because of their market. We wound up going to this beautiful little village three separate times during our stay, because we enjoyed it so much. Twice for their market and once for information gathering from their tourist office. 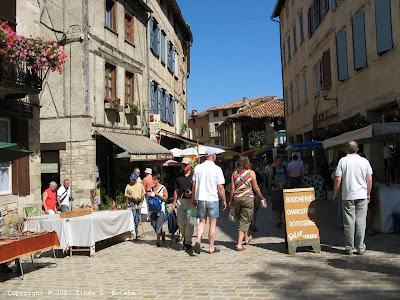 The tourists to Saint-Antonin (or to the Midi-Pyrenees region in general) are mostly Brits and Dutch and most are there to simply soak up the beauty, but few ask the pointed questions I did about their history and legends. And seldom are there American tourists in this region, which I think is a shame because this area of France is wonderful. Saint Antonin is situated at the confluence of the Aveyron and Bonnett Rivers and was called Condat during the Celtic period. Later, the Romans thought this was a "noble valley" and so the area was called Noble Val. Then comes the legend of Saint Antonin which unfortunately is not listed in the online list of Catholic saints. There are many Saint Anthonys, but I once went through and checked each one and none had a story like this one that was given to me by the Tourist Office. Due to my L.O.O.N.ish tendencies I must interject here that any missionary would not be called a saint during his or her lifetime, and the town of Pamiers was not named that at the time. Prior to the time of the Crusades, the town was Frédélas. At that time, there was a rich and powerful count called Festus who ruled the 'Noble Val' of the Averyon valley. He recognised the hand of God in this wonderful voyage and laid the remains of the martyr in an impressive shrine where later an abbey was erected on the site." The town credits the founding of the abbey to Pepin le Bref, better known as Charlemagne's father. Here is a picture of the historical marker which marks the spot of an abbey that was founded by a powerful Frankish king. And this is what is left of that abbey. Not much, eh? And no, it is not the steps, just the few pitiful stones left in a heap that the gardeners have to mow around. One more historical marker just for good measure to show that at one time there was an abbey here that reportedly dates back to the time of Charlemagne which is the time period for my story. The town furthermore states that this was one of "three great Benedictine abbeys in the region of Rouerge with Conques and Vabres." I had chosen to set the climax of my story in Saint Antonin because I needed a town in close proximity to other settings. I also needed to have an abbey. To find out that Saint Antonin not only had an abbey, but having it date back to Pepin le Bref was wonderful news to me. It validated my choice. And since no one can tell me what the town looked like when the abbey was around, I am free to make it bend to my plot necessities. The tourist office provided a map of the town and one feature to note was this stone engraving that is over someone's doorway that was supposed to have been taken from the crumbling abbey. Recycling if you will. I believe it is supposed to be Jonah being swallowed by a whale. The village had been named Saint Antonin for many centuries, but according to our guide it was in the 1950s that it was decided to add the words Noble Val to pay homage to its historical roots. Thus the full name of this village is Saint-Antonin-Noble-Val. According to the Michelin Green Guide the population is less than 2,000. However in comparison to the surrounding area, it seems like it is a big town and the farmers market was quite popular. There were several streets that were filled with merchant stalls. Here is a picture of spices that unfortunately there is not the accompanying heady smell. One vendor had about fifty different kinds of olives. Or perhaps it merely seemed that way, but alas we did not take a picture of his wide variety that seemed to stretch farther than many salad bars I have seen. This picture is taken from the beginning of the market which stretched down the length of this street and spilled out onto another street. There were fruits, vegetables, breads, meats, fish, sausages, clothes, leather goods, books, baskets, jewelry, and even kittens. We had to stop when we saw kittens. I said the universal "awwwwe" when I picked up one of the kitties. The young woman then asked if I would like one. I had to reply, "Je desolée. Je habite en Californie." Her eyes grew wide and then seemed to understand. She did allow us to take a picture of her. Here I am with the cute little one. I just love the little pink tongue hanging out. Of course he had just been drinking some milk right before I picked him up. Then there were vendors who sold wine. You could buy a bottle of wine or bring your own and have it filled. Then :shudders: they also had boxed wine. That is just. So. Wrong. I hate it that there is boxed wine available for sale in Sonoma County and/or the thought that some of the grapes grown here might be used to make wine stored in polystyrene. It just seems sacrilegious that there should be such things in France. As for the town itself, it has a marvelous medieval charm about it. The buildings are old and stone, the streets are narrow. People live in the town itself and it is a bit scary when cars are traversing the narrow passageways. Here you can see what passes for a driveway before someone's home. Here is a view of the center of the village on a non-market day. If it looks somewhat familiar, perhaps you have seen the movie Charlotte Gray which was filmed in Saint Antonin. It is a World War II film and the filmmakers had Nazi tanks coming down this very street with that hall in the background. I am amazed that they were able to maneuver tanks down that street. Charlotte Gray is a good film, and whether or not you like the story or the acting, you cannot fault the beauty of the landscape that is shown. On another post I will show you the Aveyron gorges. I just tried to upload those pictures, but got an error code from Blogger. I think I shall stop now before it eats another post of mine. 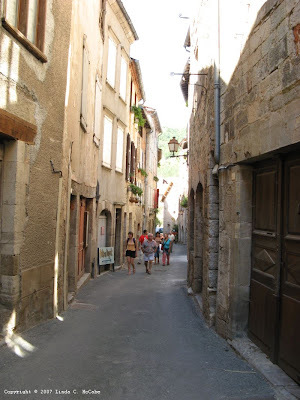 Check your history St Antonin only became St Antonin Noble Val recently! The town's official website does not mention when Nobel Val was appended. So until I discover a citation that with a definitive date of when this occured, I feel I must stand by what I was told. Thank you for stopping by and I hope you enjoy other posts of places in the gorgeous Midi-Pyrenees region.